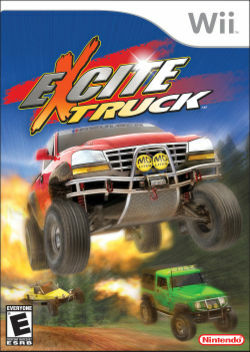 Excite Truck is a launch title for the Nintendo platform Wii. It is a driving game featuring large trucks. The title is based on the classic NES game Excitebike and hopes to rekindle similar action. Excite Truck puts the player in the driver's seat by using the Wii controller in a horizontal position to simulate a steering Wheel. One of the game's major features is the ability to actively changing terrain with powerups. Similar to excitebike players must angle their vehicle (by tilting the Wii controller) so that all four wheels land at once which, if done perfectly, results in a large speed boost. This is the first time in which you'll be able to play your mp3 through the SD card as a background music whilst you play the game. This page was last edited on 10 July 2017, at 11:14.